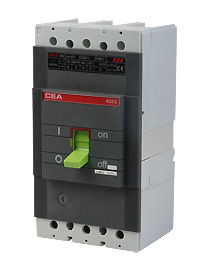 CEM15 series moulded case circuit breaker is suitable for the circuit of AC 50Hz(or 60Hz),rated insulation Voltage 660V, rated operating Voltage under AC 660V,250V(DC), rated operating current 10-800A.It is for distributing energy of electricity and infrequent switch-over under normal conditions. The MCC B rated current under 400A.They are provided with the function of the protection against over-load and short circuit and undervoltage . The MCCB complies with standard of I EC947-2.